Discussion in 'Disney's Hollywood Studios' started by Nick, Jul 26, 2017. 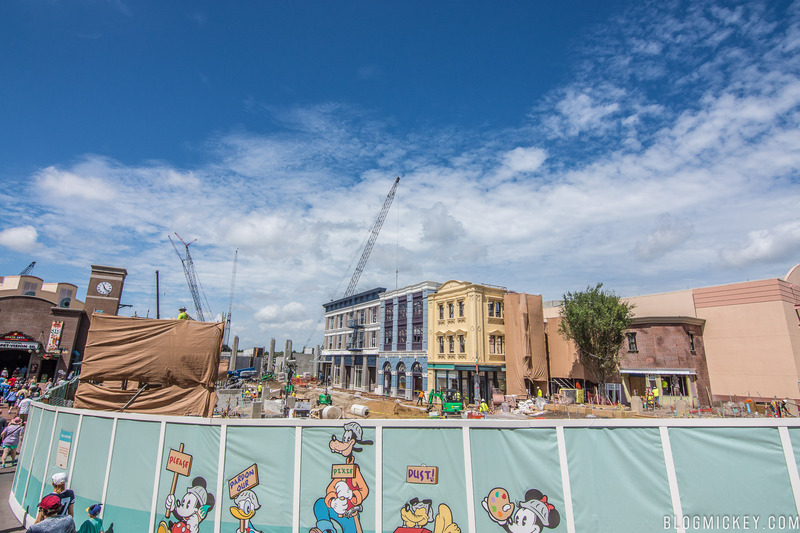 As part of the multi-year reimagining of Disney’s Hollywood Studios, the area adjacent to Muppet Courtyard will reopen this fall as Grand Avenue. Inspired by present-day Downtown Los Angeles (DTLA), Grand Avenue captures the spirit of DTLA with facades of trendy shops, lofts, restaurants and other businesses utilizing former office buildings and warehouses that have been converted over the last couple of decades. Grand Avenue serves as a place of community, recreation and relaxation. Recently, as part of this transformation, the theater that houses Muppet*Vision 3D was named Grand Arts Theatre and given a new marquee inspired by a restored movie palace. Opening this fall on Grand Avenue, BaseLine Tap House will be the newest food and beverage location at Disney’s Hollywood Studios. This quaint brick building offers Guests a cheerful location to enjoy light snacks along with beer and wine from California. Porkchop, tankart150, Alicia and 1 other person like this. I hope there's a good, CA beer menu. While the microbrew movement is prominently "drink local" I hope this works. This would be a great way for Disney to bring some uncommon drafts to FL such as Pliny the Elder, Bruery, and more. But we'll probably just get some Anchor and that micro that's in DCA. tankart150 and Nick like this. I think breweries such as Russian river are so thin in supply it would be hard to get Disney top product all year round. I would pay for it though. It says in the announcement that the pub will be in a "quaint brick building" so I'm guessing The Writer's Stop will be the entrance? Since none of the streets of America structures look like brick to me. And there is a scrim over Writer's Stop right now. Now, I imagine they're enclosing the SoA structures to make that the actual inside of the pub, just looks like the Writer's Stop side might be the main entrance. And the outside terrace under shady trees they talked about goes along the long side of the recently painted buildings resembling an LA street. Yeah, the entrance to the Tap House will be where The Writer's Stop was. 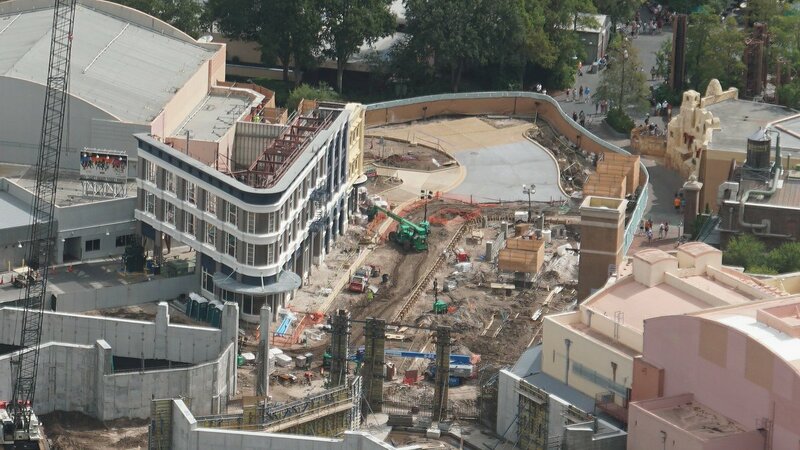 There will be a lot of outdoor seating here where the new outdoor patio is around the tree in the aerials. tankart150, Joel, LieutLaww and 2 others like this. Looks like the Writers Stop, with a door to SciFi Dine-in on the right. And no additional space added. Guess the outdoor seating under the tree is the only additional space for this one. I'm still thinking the SoA facades that are left get enclosed and turned into a Club 33 with second level views overlooking Star Wars (somewhat.) But it doesn't look like they'll be used for this project to me. I think this is a great idea for the Writer's Stop space. tankart150 and Alicia like this. Remember when it first opened it was called "Buy the Book," named after the book store from Ellen Degeneres's sitcom? tankart150, Disneyhead and Mr. EPCOT like this. A lifetime ago. It's always kind of in the back of my head as "Ellen's book shop"
Since it was a set from a sitcom, there were lots of studio lights overhead... Something that was not changed when the name changed. Size looks fine, I've been in smaller bars in parks before. tankart150, AlexanderMBush and Alicia like this. I'm happy with this, another well situated adult stop... I wonder if this will be the replacement for "High Octane Refreshments" at the Studios Catering Co. Although it doesn't sound like it would be a full bar and more like a beer and wine. If so! I wonder if it will ever be replaced. I doubt toy story land would promote one and I have a feeling that the SWL Cantina will be a bit too busy with the theme. Meaning, they might only offer their land's themed drinks. The backstory to this bar is literally gentrification. An old printing company becoming a bar. I just can't get over that. tankart150 and Joel like this. A Craft Beer and Wine Bar with café style outdoor seating in a retrofitted print shop. Sounds like bait for hip vloggers with trendy facial hair. tankart150, Joel, JoeCamel and 2 others like this. It'll just be another detour for you before you make it to Galaxy's Edge. tankart150, Joel and Disneyhead like this. Or your last chance for a real stiff drink before you get in the multi hour lines. You think wand magic lines are bad? Wait till you see the ones to "interact" in Star Wars land. tankart150, Alicia and Coasted like this. tankart150, Disneyhead and Nick like this.